A winter escape to Miami. 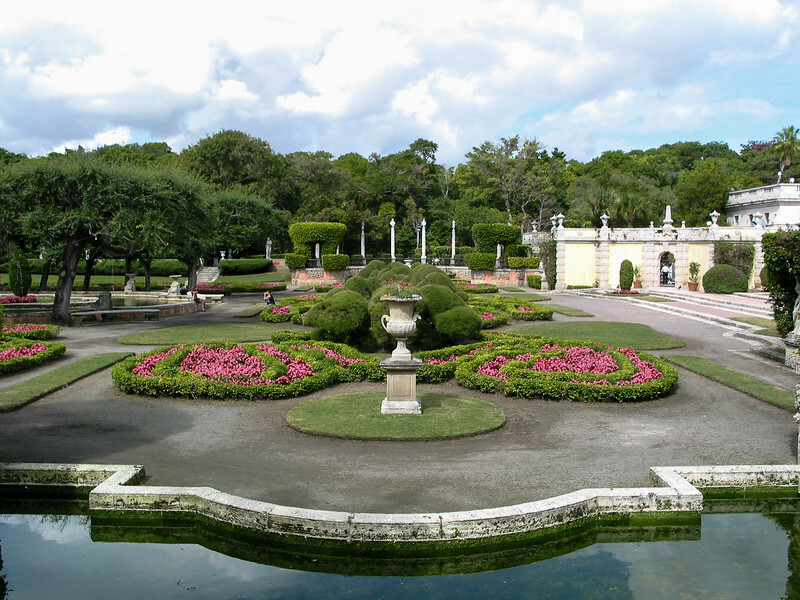 I visited Vizcaya, the winter home of James Deering, Vice President of International Harvester. It was built from 1914 to 1916, employing 1/10th of Miami's then population of 10,000. It's rather like "Versailles in Miami", in miniature, with a touch of Venice on the waterfront. And I went to South Beach, the southern part of the town of Miami Beach, on the barrier beach oceanwards of Miami proper. It boasts an outstanding collection of Art Deco buildings of the 1930's, and represents a miracle of revitalization. The place was apparently a wreck by the 1970's, but then a volunteer design preservation league established a historical district, and since then, the area has become very fashionable indeed. Part of the charm comes from the Art Deco designs themselves: clean, geometric, and whimsical. Part from the wild pastel-plus color schemes, which apparently are not historical, but rather a more modern touch. And part from the location and climate, with the palm trees and warm weather making for a relaxed resort atmosphere.